To access your server via SSH / SFTP you will need to import your private SSH Key, which can be done in two different ways. The following process takes you through the copy and paste import method as prior to version 1.0.3 there was a bug preventing you from transferring the files via iTunes.Before we begin, we will need your SSH private key in OpenSSH format. If you have generated your key in Windows using PuTTYgen, it is possible that the key is not in the correct format and may need to be loaded and converted (Conversions > Export OpenSSH Format). 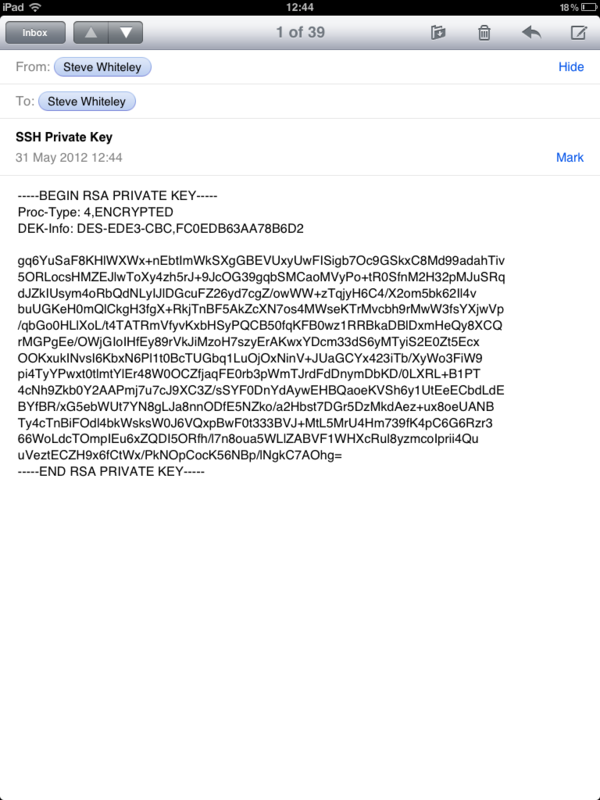 The easiest way to get the private key onto your iPad is to email it to yourself. For the purpose of this example I have created an example private key and emailed it to an account available on the iPad. You should copy the entire key to the clipboard by using the long press action on the screen and choosing the “Select All” option. Now that you have this in the clipboard we can proceed to opening up the Diet Coda application. Once loaded, click on the add site icon and complete the Site Settings and begin entering the Connection Settings. 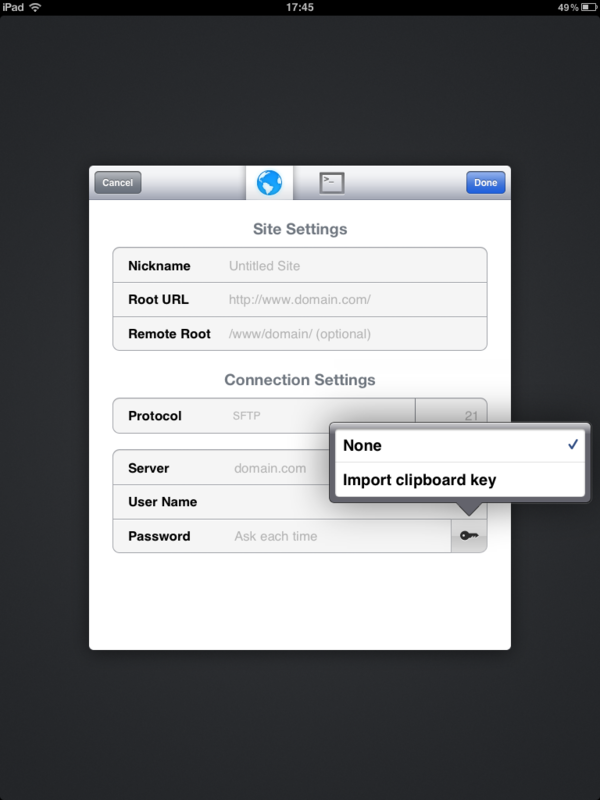 At this point you can click the key icon to be presented with a list of available keys, select “Imported clipboard key” to use the key copied to he clipboard. If your key uses a passphrase, enter this in the Password field. Click “Done” to attempt to connect to the server using the specified details. If you are successful you will be shown the file editor, otherwise an error will be returned. Next time you create a connection you will be able to choose the imported key from the list instead of having to import it every time, just select “Imported key” from the list. Click “Done” to attempt to connect to the server and begin editing files. If you are having any problems with the Diet Coda application, please refer to the Diet Coda website or contact Prompt directly. Emailing it to yourself is not an option anymore these days… you should definitly transfer the private key securely using the local network your in!